Friend was worried and sounded the alarm: Fatal acts of violence in Ebergassing. There is no trace of the culprit. For almost four days her best friend had not heard from her. She was worried about the 64-year- old, single pensioner Hedwig S. from Ebergassing, Bruck an der Leitha. Because she ran out of an accident in the apartment, she first sounded the alarm in the community. There they notified the police. Friday afternoon was followed by the first shocking news: The woman was found dead. Meanwhile, the autopsy result is available. The 64-year-old might have been killed with a heavy object. The murder group of the state criminal investigation office Lower Austria took over the investigations. 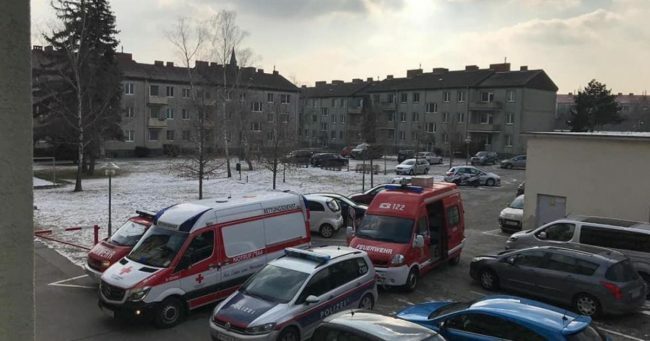 At about 12 o’clock, police, fire brigade and rescue were called to the housing complex in Himberger Strasse to look for the woman. “We were contacted by the officials and asked to open the locked door. It was suspected that the woman would be injured in her apartment after an accident, “said fire brigade commander Michael Zotter. In the apartment, however, only the lifeless body of the 64-year-old’s was be found. According to police, the body lay on its back in the living room and had severe injuries in the head area. After the first assessment it was clear to the police that it might be an act of violence. The ambulance was also assumed by a third party debt, said Friedrich Köhl of the prosecutor Korneuburg. The autopsy on Saturday morning provided the confirmation. The cause of death is a craniocerebral trauma due to massive head injury. “Several powerful blows may have caused the death,” said Köhl. The approximate time of death is said to have been mid-week. There is no trace of the culprit, explains Omar Haijawi-Pirchner, head of the state criminal investigation office. Whether it was a robbery, is still the subject of investigation. The apartment was certainly not ransacked and devastated. Also, it is still unclear with what subject struck on the victim. Currently, officials are investigating the victim’s environment. According to KURIER information, Hedwig S. is said to have had no contact with her only child for six years. The case in Ebergassing is already the fifth lethal act of violence against women in Lower Austria this year and the sixth in Austria. The series had started on January 8, when a 40-year -old was stabbed to death in Amstetten. A day later, a 50-year-old was killed in Krumbach, district Wiener Neustadt by a knife attack. On January 13, the body of a 16-year-old was discovered in a park in Wiener Neustadt . The death of the girl came by suffocation. Three days later, a 25-year-old died at the Vienna Central Station by knife wounds. And on Monday, a 32-year-old was killed in Tulln by stabbing her with a dagger.